Home / Face / What’s The Difference Between PLA and PDO Thread Lift? If you want to achieve the kind of mini facelift or contouring but don’t want to go under the knife, you can choose to have an absorbable thread lift instead. The good news: It’s minimally invasive, requires little to no downtime, and is more affordable than surgery. 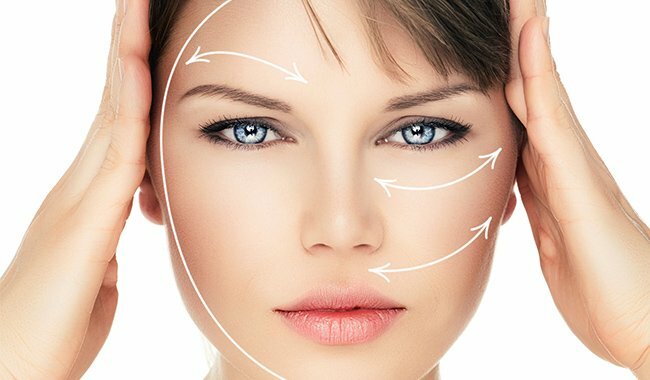 A thread lift is done in a medical aesthetic clinic by an aesthetic doctor or skin care specialist trained in performing this particular procedure. There are blood vessels and other nerves underneath the skin, so you want someone who has expertise and certification to get the most beautiful result without puckering, slight depression and other skin irregularities that are possible side effects of this treatment. If you’re contemplating on getting a skin tightening or face lifting treatment, consider the following comparisons between PLA and PDO thread lifts. PLA sutures use poly L-lactic acid sutures with bidirectional cones made from a biocompatible polymer that has been used in orthopaedic pins, rods, screws and nails for bone fractures, and of course, sutures, for many years. PLA sutures are resorbable, acting on the deeper layers of the skin so they stimulate the body to produce its own collagen. PDO thread lifts use cogged polydioxanone threads, which are biodegradable synthetic polymer that has also been used in surgical applications for many years due in large part to its greater strength and pliability than other monofilament sutures. After being absorbed into the body over 6-8 months by simple hydrolysis (involving water and carbon dioxide), PDO threads retain their strength and encourage a low-order tissue response, leaving new collagen in their place. PLA thread not only lifts sagging skin immediately and regenerates collagen over time as the sutures are resorbed, but also increases the volume of saggy areas and restores shapeliness to the face. PDO thread, on the other hand, focuses more on tightening and lifting of sagging skin not just on the face but in other parts of the body, including those that have sagged due to obesity. PDO sutures can be positioned such that they result to a V-shaped face. PLA sutures by Silhouette Soft are US FDA-cleared and European CE-marked for the following areas: eyebrows, cheeks and mid-face areas, jaw line, and neck. 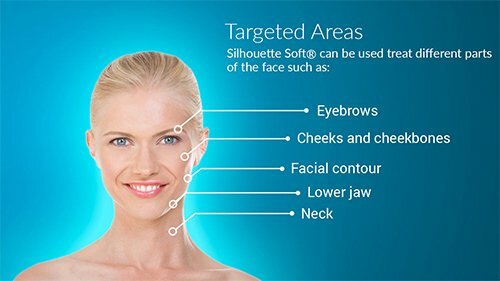 Because the focus of Silhouette face lift is also on restoring the youthful shape of the patient’s face, PLA threads are indicated to bring out the contours of the face. 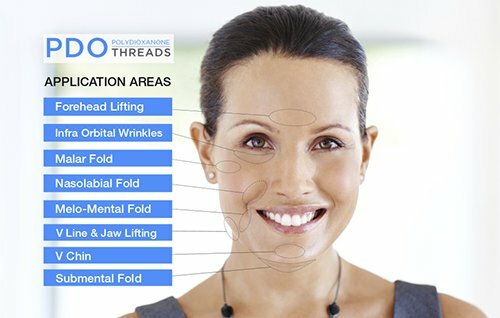 PDO thread can be used not only on the face but also in other areas of the body. If Botulinum Toxin (or more commonly known as Botox) has not produced a strong enough result for you, then you can use PDO thread lift to correct horizontal and vertical forehead wrinkles, lift the forehead, brow, lower eyelids and cheeks, minimize naso-labial folds, marionette lines and smokers’ lines, smooth out creased cheeks and chin, and redefine the jaw line. PDO sutures can also be used as non surgical wrinkle treatment to correct wrinkles on the neck and cleavage, firm and shape the breast and chest, lift and tighten sagging skin and stretch marks on the belly, buttocks, arms and legs, and lift and tighten excess skin in the arms, ribs, belly, thighs and buttocks due to obesity. Patients who have undergone liposuction treatment and want to have tighter and firmer skin can also have PDO thread inserted into their insensitive subcutaneous tissue. Both PLA and PDO thread lifts pull up sagging skin and regenerate collagen by implanting threads into the subcutaneous layer of the skin (to a depth of about 5mm) using small needles. These sutures in turn create micro-injuries that trigger collagen synthesis and tissue contraction. There is no need to take out the thread after the treatment, which leave behind lasting effects – but no scars – long after the sutures have dissolved: up to 2 years for PDO thread and up to 18 months for PLA thread.